The media run up to my seeing Kingsman: The Secret Service was perhaps one of the most confusing and misrepresentative marketing campaigns I have ever experienced. By all accounts, I assumed that the new film by director Matthew Vaughn was something of an Alex Rider, Cody Banks young adult type affair, full of fun and frolic but ultimately aimed at a much younger demographic than myself. Then all of a sudden, it comes to my attention that in very un-Cody Banks fashion, the film is accompanied in the UK with a 15 certificate. At this point, all bets were off and I entered the cinema without a single clue as to what this film had in store for me. And what did it have in store for me? Two hours of pretty much consistent fun. 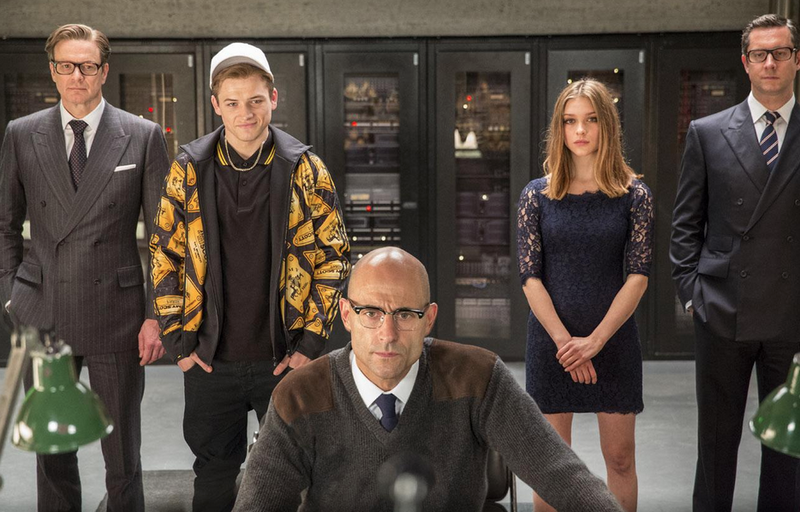 Kingsman: The Secret Service could be best described as Attack The Block meets Roger Moore era James Bond. The film tells the story of Eggsy (Taron Egerton), a troubled inner city teenager on the road to ruin who finds himself following in the mysterious footsteps of his dead father in training to become part of the Kingsman, an elite secret service who operate under the guise of a luxury London tailors. Acting as Eggsy’s mentor in this survival of the fittest type test is Harry Hart (Colin Firth), one of the Kingsman leading agents and a friend of Eggsy’s late father. The narrative progresses as something of a split plot, with the training academy taking place amidst the emergence of an eccentric super villain in the form of Richmond Valentine (Samuel L. Jackson), a billionaire tech mogul with ambitions to control the world via his widely used free SIM cards. Everything about the plot is gloriously farfetched and ridiculous, but that is exactly what the filmmakers have set out to present. There is absolutely no interest from the filmmakers in Kingsman: The Secret Service portraying any kind of realistic spy work, and thank god. There are plenty of other more serious films I can turn to for that. What the audience are treated to instead is a whirlwind of cool and spectacular gadgets, mostly humorous dialogue and truly some of the best action set pieces I have seen in a very long time. Some would argue that in the characterisation of Eggsy and his peers, the portrayal of inner city urban youth culture is rather hackneyed, but the narrative operates in such an exaggerated and over the top universe that one does not feel neccesarily bothered by these representations. Just as urban teenage Londoners act like extras from Kidulthood, so too are the villains of the piece given the same outlandish treatment. Every apect of the film is turned up to eleven and in doing so the filmmakers find a happy medium in which nothing is realistic but everything is enjoyable. There is one notable occasion right at the very end of film in which the narrative descends in to really cheap and vulgar humour. 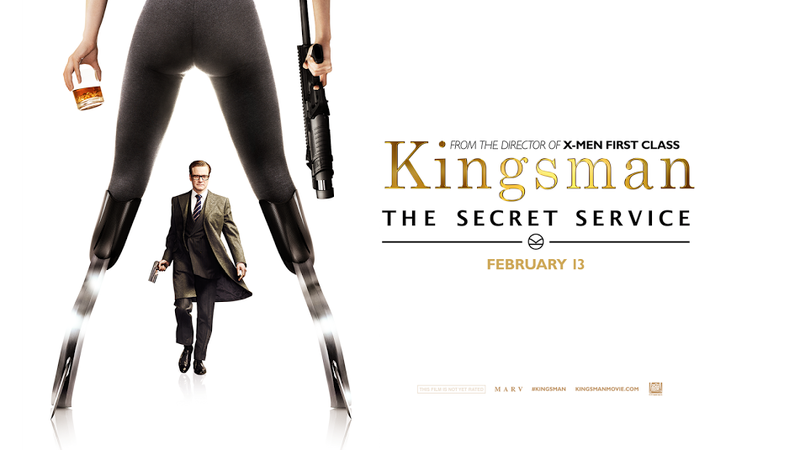 This is unfortunate as up to this point the picture had maintained a really pleasing balance of “laddish comedy’ and classic slapstick without ever causing particular offence.The film deserves its 15 certificate for strong language and scenes of graphic violence, but in a strange and interesting way, Kingsman: The Secret Service still feels like a wacky kid’s film much like the ones mentioned previously. Though a relative unknown, Taron Egerton looks at ease as the film’s young protagonist Eggsy. Though his characterisation at times is certainly that of a stereotypical ‘lad’, Egerton pulls the role of with a confident swagger and proves he can face the challenge of acting with some Britain’s greatest cinematic talents. The primary of these being Colin Firth as Harry Hart. Firth arguably steals the show as the uber confident, in control spy, revelling in the eccentric nature of the plot and not holding back at all when it comes to the more over the top moment and set pieces. In fact, Firth is responsible for many of the film’s best action sequences, including a fight scene in a church that really has to be seen to be believed, I have never seen anything quite like it. Notables filling out the rest of the cast list include Mark Strong as Merlin, the Kingsman’s own version of Q mixed with a little of bit of stern headmaster. Strong and Egerton enjoy a number of great scenes together and their chemistry as well as Egerton and Firth’s chemistry really adds to the heart of the picture. Michael Caine has a few cameo scenes as the head of the Kingsman operation, and whilst his on screen presence adds a touch of star quality to proceedings, his performance is solid if not particularly memorable. Samuel L. Jackson as villain Richmond Valentine is as camp as they come and is clearly having a ball in the role. The plans he hatches hark back to the good old days of Roger Moore’s years as Bond, with secret islands and countdown clocks all over the place. Overall, Kingsman: The Secret Service is an absolute romp of a film that takes you hostage in the first ten minutes and keeps you strapped in until the very end. Perhaps it was my complete misunderstanding of what the film actually was, but I can’t think of anything else quite like it. I suppose there is an air of Austen Powers about the picture, but with a great deal more violence and great deal more adult content. In a weird way, the film has the effect of bringing all the nostalgic elements of action films from your childhood and giving them an updated, adult sensibility. A surprise pleasure for me, and I would hope a surprise pleasure for many others too. Nice to know I wasn’t the only one who was floored when I saw this got a R rating here in the states, even if it is directed by Vaughn! Nice review. Really looking forward to this one. I love Matthew Vaughn’s work a lot. Awesome blog, keep up the excellent work. I just started one of my own. Check it out if you get a chance! “Attack the Block meets Roger Moore-era James Bond” — nicely done!